What easy flowers to grow indoors? How to create a beautiful indoor garden and be sure that the plants and flowers we chose will be thriving and a fresh accent to the interior? Which plant containers and flower pots to choose and how to water your indoor plants? How to protect your plants from pests and diseases? We shall give you useful tips which will be of help not only to beginners and hobby gardeners but to anyone who loves to grow plants at home. House plants come to our homes for a variety of reasons – as a birthday gift, as a gift for Mother’s Day or simply because we want to make our homes more beautiful. 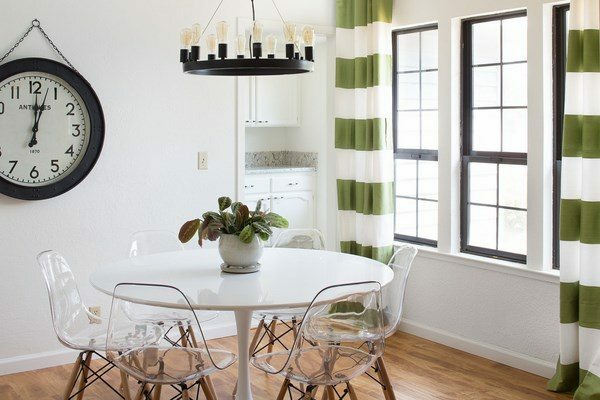 Homeowners, designers, and decorators are aware that potted plants are an element of the home decor and sometimes can change the atmosphere of the home radically. 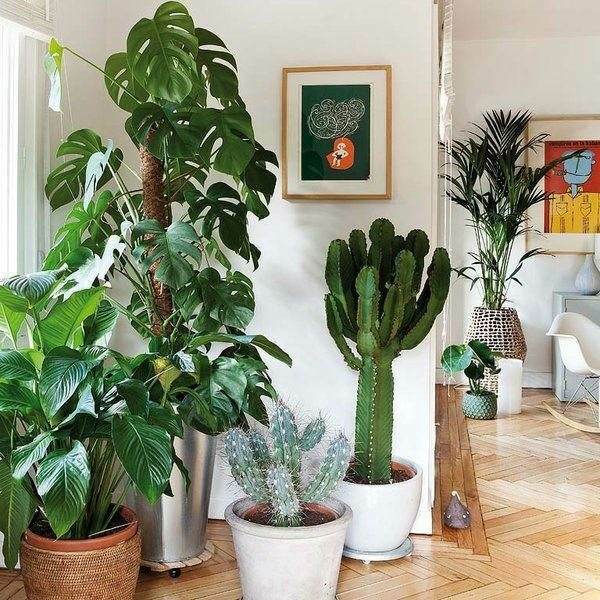 Well-chosen indoor plants in the interior complement and complete the design ideas, accentuate the decor style and bring something pure and natural that is so important to all of us who live in the urban environment. However, in many homes a collection of indoor plants is displayed on a windowsill or a number of flower pots are arranged in a corner and have nothing to do with the overall design and the style of the home. 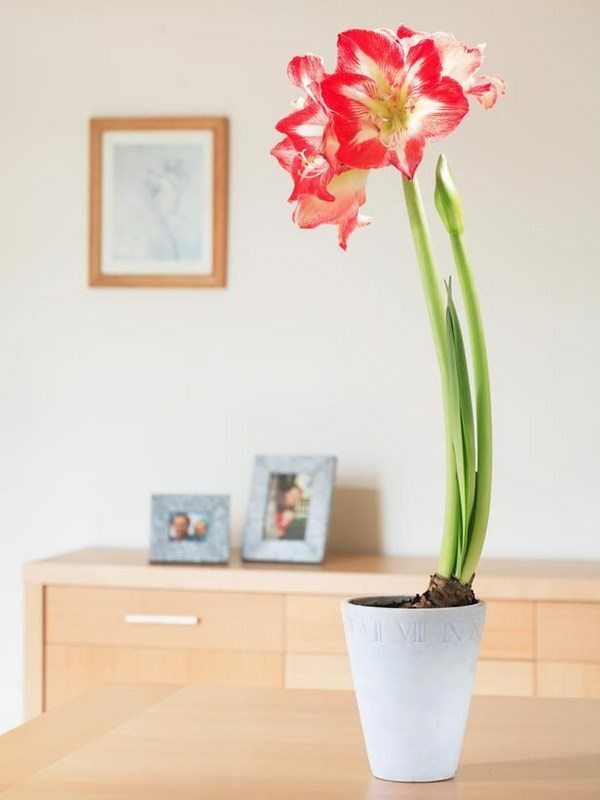 It is understandable that people just haven’t got the heart to throw away any flower but if you tried to combine the right indoor plants with the interior style of your home you will see an instant transformation. 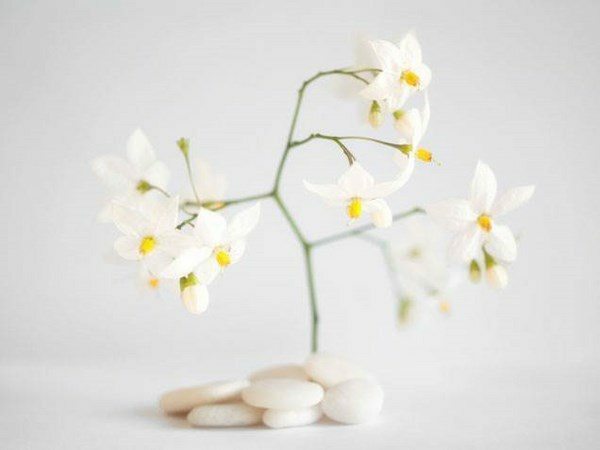 Just think how weird a bonsai tree will look in a rustic interior or how a row of potted violets will look in a minimalist home decor? There are many easy flowers to grow indoors and the options are numerous which may be very confusing. 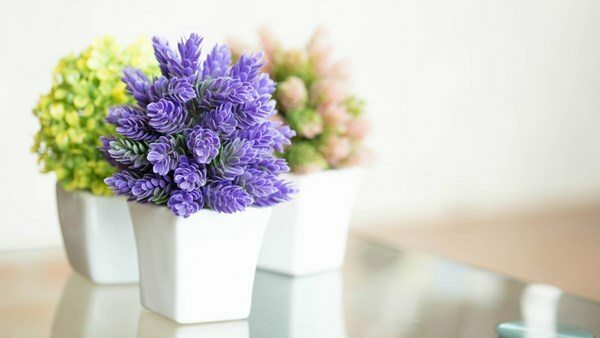 How to choose the right plants and flowers? You need to look at the lighting conditions of your home, the temperature, if you have pets or small children you need to think which plants will be suitable to grow indoors and of course, you have to consider carefully the available space for your indoor garden. 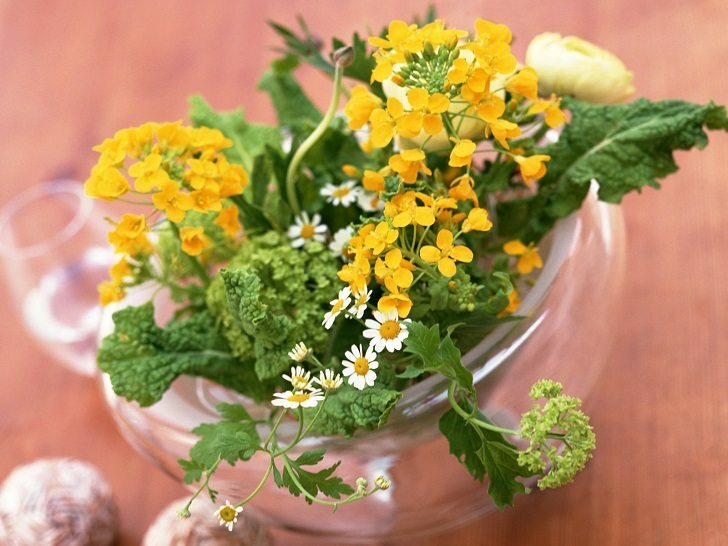 Sometimes a small herb garden on the window sill will look much more vivid than a flowering maple in a dark corner. 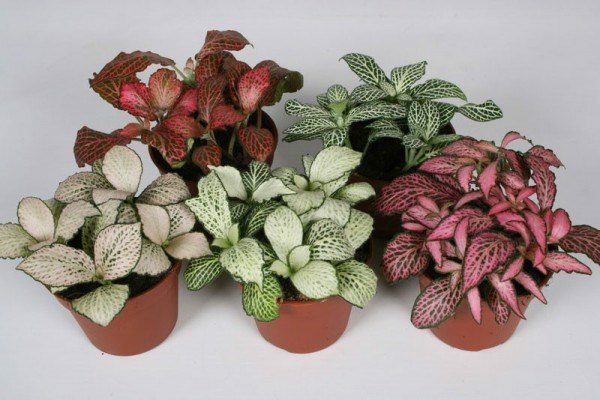 The success of breeding house plants actually depends on simple rules – choosing the right locations, a suitable container (pot) and knowledge for the particular care and maintenance that each house plant needs – proper watering, fertilizing and timely detection and prevention of diseases. Houseplants are divided into different groups and there are many classifications – flowering, deciduous, bulbous and tuberous is one of them. 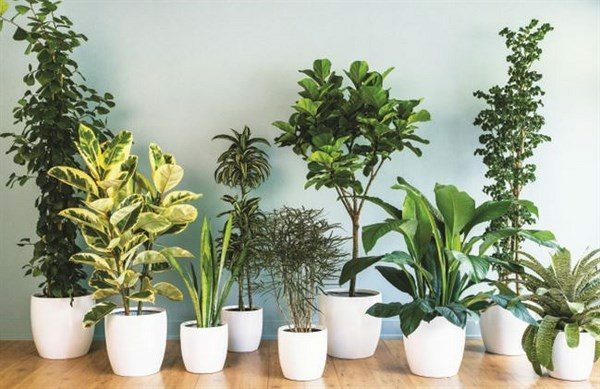 Another way to classify house plants is to divide them into groups – flowering, tropical, exotic, terrarium plants, indoor trees, plants that clean the air, indoor herb or vegetable garden plants, poisonous house plants, etc. Of course, the list above is not limited to these plants only and the division into groups is only conditional. 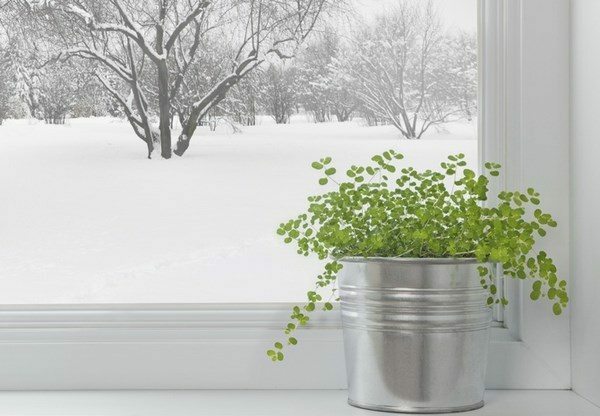 When choosing a place for indoor plants you should consider the windows, which are located on the east or west as a universal spot. The group of light loving plants includes cacti, passion flower, succulents – aloe, euphorbia, agave, Haworthia, Gasteria, Stapelia, Bougainvillea, Laurel, herbaceous plants, flowering plants, etc. Some shade loving plants species are Tradescantia, Clivia, Philodendron, Pothos, Boston Fern, Dieffenbachia, Monstera, Cast Iron Plant, etc. Keep in mind that shade-loving plants still prefer partial shade and not a complete shadow. Shade tolerant plants include species like Ficus, Dracaena, Asparagus, Begonia, the Amaranth family, Ivy, etc. Before looking at the easy flowers to grow indoors, we want to take a quick look at the poisonous house plants which you should avoid as they may be dangerous for your little children and pets as some can cause skin irritation and others may cause illness if eaten. Although children are not likely to eat indoor plants, some cats and dogs like to chew the leaves of plants which can lead to vomiting, drooling or abnormal behavior. Keep in mind that all parts of Angel’s Trumpet (Datura candida), Calla Lily (Zantedeschia species), Lily of the Valley (Convallaria majalis), Oleander (Nerium oleander), Poison Primrose (Primula obconica), ZZ Plant (Zamioculcas zamiifolia) are extremely poisonous. The leaves of Chrysanthemum (Chrysanthemum morifolium) English Ivy (Hedera helix), Swiss Cheese Plant (Monstera deliciosa) are poisonous if eaten and cause skin irritation. Beginners and hobby gardeners should keep to some general rules which will help them have healthy and beautiful house plants. In the first place, remember, that indoor plants need well-draining soil, which means that you have to choose pots and containers with holes in the bottom and a drainage container or add a layer of gravel on the bottom of the pots before adding soil so that the water will drain through the gravel. Despite that each plant requires a different type of soil, you can use a potting mix as a start. Such mixes are sold in garden centers and work fine for most house plants. Many house plants grow best in areas with lots of natural light and sunlight but there are as many plant species who prefer shady spots or a shade tolerant. In addition indoor plants, although referred to as light loving, seldom feel very well if exposed to direct sunlight. It can not only burn the plant but even destroy it. How to choose a suitable plant container? 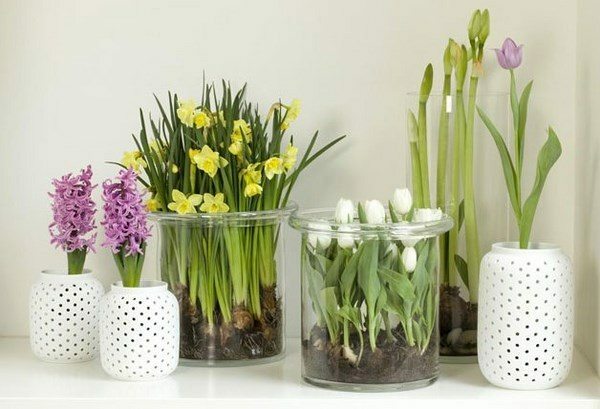 Choose a container that not only complements your decorating style but suits your plant as well. The size of the plant container is very important as it should be suitable for the plant. 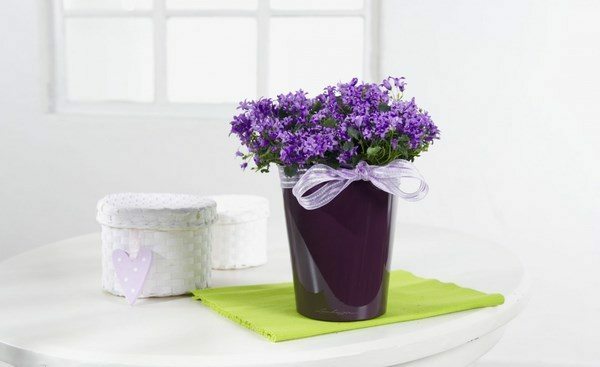 The basic rule is to choose the smallest container which accommodates the roots of the plant. 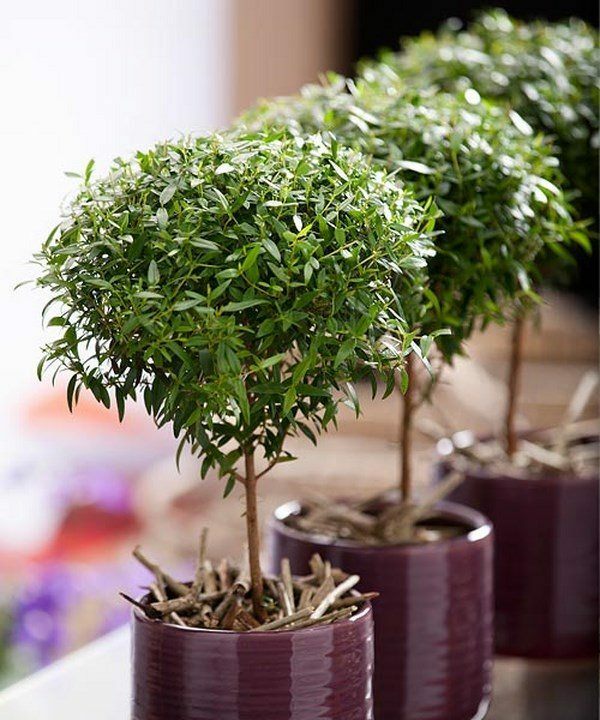 In a small pot moisture is absorbed quicker and in this way, the soil will not retain excessive water. Another important consideration when choosing flower pots and plant containers for house plants is the material. The market offers many different options and each material has its own advantages and disadvantages. We shall make a quick review of the most popular materials. Plastic pots are the cheapest option. 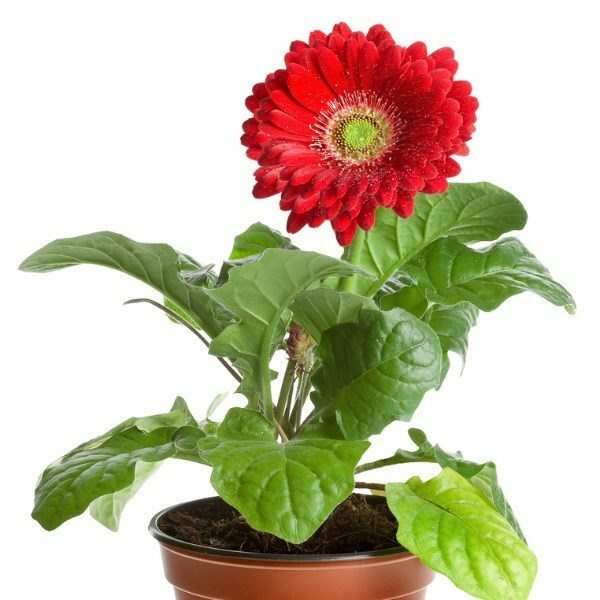 They are light weight and come in a wide variety of color and sizes which make them one of the most popular choices of customers for indoor gardens. Due to the fact that plastic flower pots are not porous, they retain moisture which means you will not need to water your plants as often. On the downside of plastic plant containers is the poor air circulation. Self-watering plant containers appeared several years ago and quickly gained popularity as these containers save you the trouble of watering your plants. Terracotta containers or clay flower pots are a true classic. They come in almost any size and depth and can be found in any garden center. Clay pots come with drainage holes, which are a must, to prevent the plants being waterlogged. You need to slip a saucer under the clay flower pot to catch the drained water. Clay flower pots are porous and have a good air circulation. In addition, any excess water can evaporate. Beginner gardeners should keep in mind that plants and flowers in clay pots will need watering more often than plants in plastic containers. Ceramic flower pots are clay pots which were hardened by baking the clay at high temperatures. When a glaze is added to the clay flower pot it performs a dual function – prevents cracking and adds a decorative value. Ceramic pots (glazed flower pots) have a great visual appeal and hold less moisture. Due to the heavy weight, they are a good choice for large plants. Being heavy is also a disadvantage of ceramic plant containers as this makes them difficult to move. Make sure that the ceramic pot has drainage holes as sometimes they are manufactured without ones. 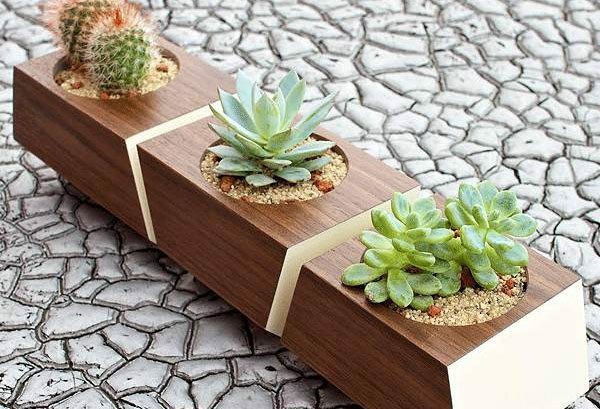 Wooden plant containers are a cheap and lightweight option and a great DIY project. Wooden containers can be made in any size and add character and texture to the home décor. Planter boxes made of wood provide good heat insulation for the soil and insulate plant roots from the sun and too much heat. However, wood can splinter or be attacked by pests, and unless the wood is treated or rot resistant, it will deteriorate. Metal plant containers are very durable and will not crack, break or chip. When new, they have a sleek shine but with time metal flower pots are susceptible to rust. Metal plant containers heat up quickly and in general, they do not provide a good insulation for the soil and the plants. Metal is nonporous so drainage is a major consideration and you need to check for drainage holes at the bottom. In case there are none, you should drill some and add a layer of gravel at the bottom to provide the draining of excess water. Concrete plant containers are durable and long lasting. They come in a wide range of styles and colors mixed into the concrete. However, they are very heavy and difficult to move. 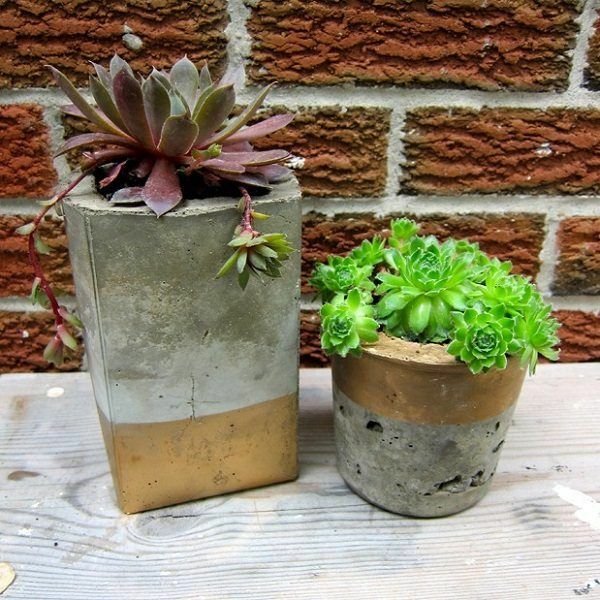 You can make concrete flower boxes or succulent planters by yourself but keep in mind the weight of the material. As much as choosing the right flower pot or plant container for your house plants, watering is essential for indoor gardens. We may talk about easy flowers to grow indoors, but if not watered correctly, your plants will struggle and even die. Here are some useful tips for indoor plants watering which will help you keep your plants healthy and thriving. It is important to know how much water your plants need. It is obvious that each plant has its own requirements and those with lush foliage will need more water than the species with fess foliage or waxy leaves. It is advisable to check out the particular needs of your house plants and group them so that it is easier to water them. As mentioned above, the flower pot or the plant containers will also determine the frequency of watering even for the easy flowers to grow indoors. Some pots made of porous materials absorb water while others do not. Experienced gardeners have a fairly good idea when a house plant needs watering. One of the easiest ways to tell if the plants need to be watered is to poke your finger into the soil up to the first knuckle. If the soil is damp the plant does not need watering but if dry – water the plant. Overwatering is the most common problem and the soggy soil leads to root rotting. 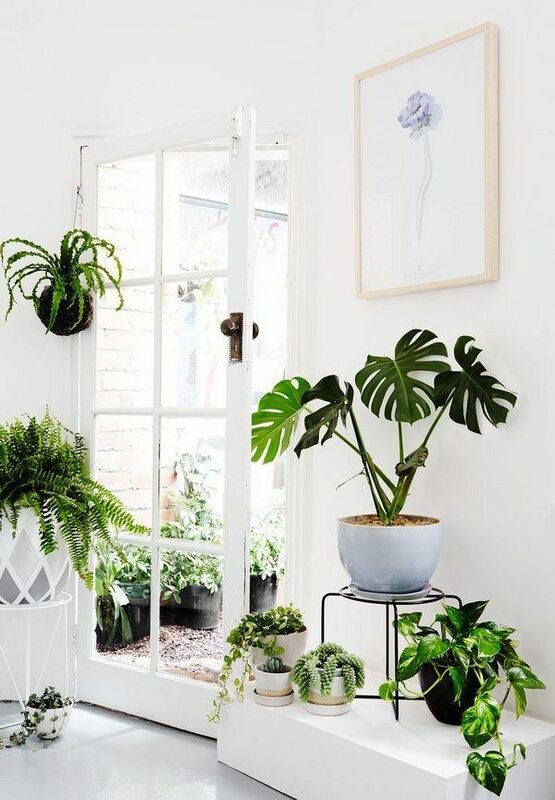 Make sure you do not overwater your house plants because water takes the place of the oxygen in the soil and they need it as much as human beings do. Do not use cold water. Best water temperature is room temperature – about 20° C (68° F/). Here is a list of 25 popular and easy flowers to grow indoors. You can combine different plants depending on your personal taste, the available space for your indoor garden, light, temperature, etc. Arrowhead plant (Syngonium podophyllum), also known as Goosefoot plant is practically versatile. Syngonium comes in many varieties and color shades. It is unpretentious and will grow in almost any home. However, keep in mind that it is invasive and will require pruning to prevent the plant from creeping around your home. Pothos (Epipremnum aureum) is one of the easy flowers to grow indoors which absorbs and strips toxins and has an air-purifying quality. 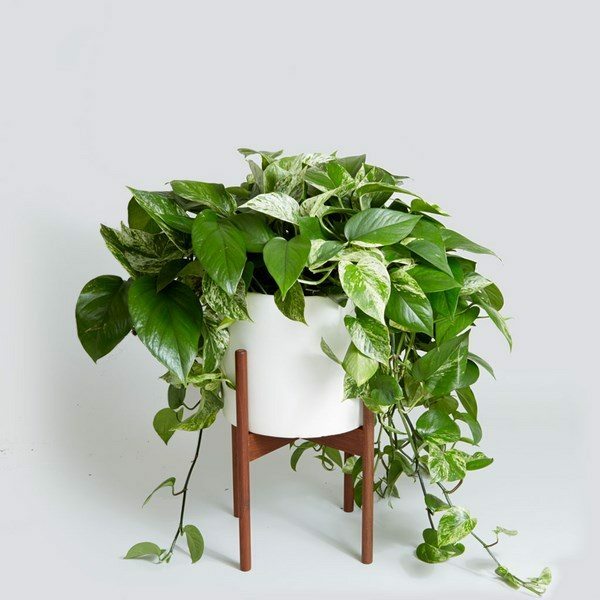 It is an easy care plant and if you keep it out of full sun, your Pothos will be thriving. However, insufficient light may diminish the leaves’ variegation. Pothos comes in a variety of colors – green, white and green, yellow-and-green, etc. Water Pothos whenever the soil feels dry. Prayer plant (Maranta leuconeura) gets its name from the fact that the leaves fold up at night. 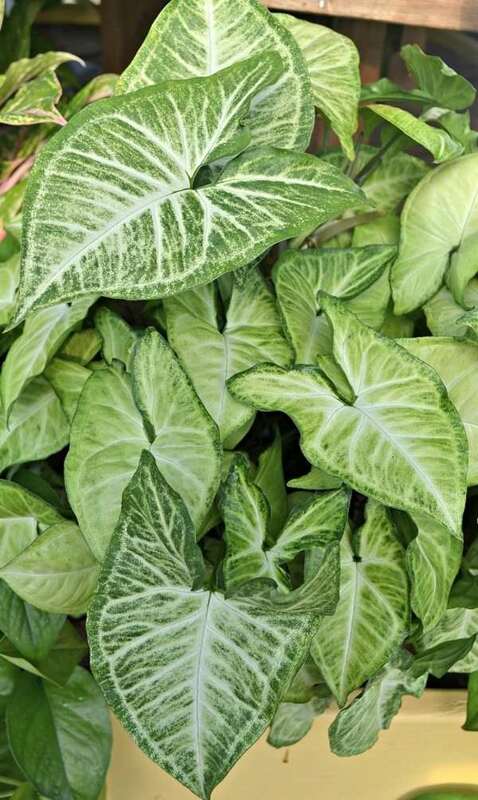 The foliage comes in a variety of shades, mostly green-and-cream with bright red veins. Like Pothos, prayer plant should be watered whenever the soil feels dry and should not be exposed to direct sunlight. Zebrina (Tradescantia zebrina ) is one of the easiest plants to grow indoors. You can keep it in a glass jar with water for months before planting it into the soil. Zebrina needs abundant watering during spring, summer and autumn and moderate watering in winter. 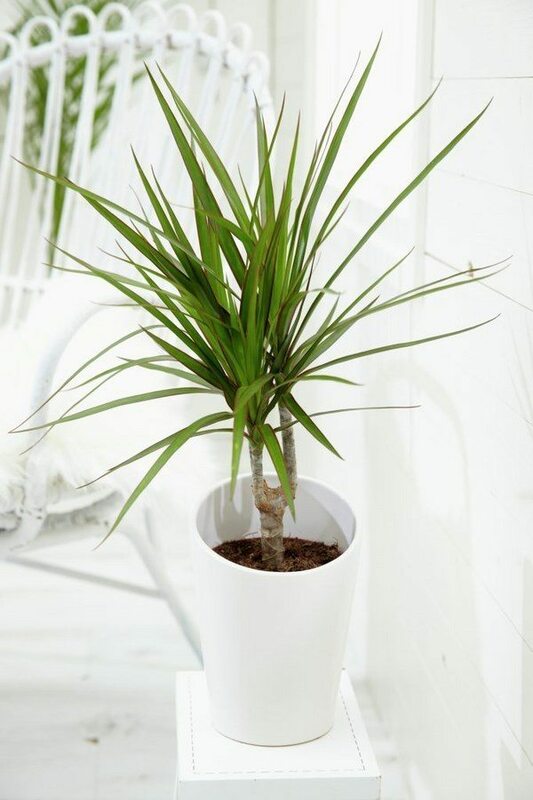 Dracaena comes in more than 120 species. The popular dracaena species which are grown as indoor plants are Dracaena marginata, Dracaena deremensis, Dracaenafragrans, Dracaena godseffiana, etc. Dracaena is also called “false palm tree”. Dracaena feels best at light shade near the eastern or western window. Bear in mind that Dracaena is poisonous to cats and dogs, and if you have pets or small children, it is better to choose other indoor plants. Peperomia is very attractive and has many (more than one thousand) different species. 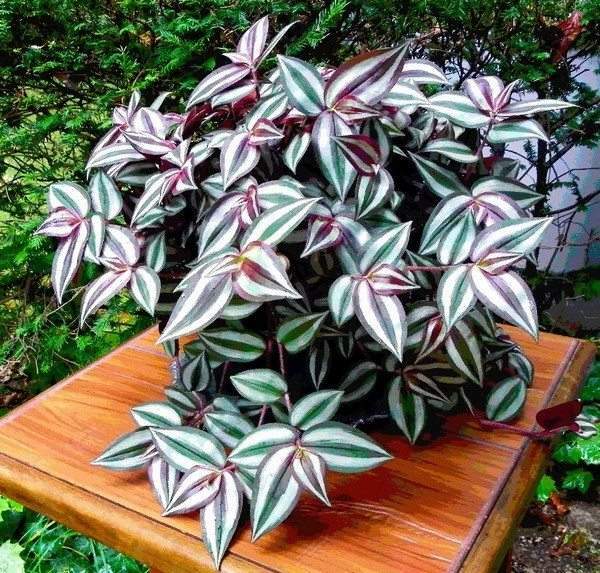 Peperomia caperata, Peperomia argyreia, Peperomia obtusifolia are among the most popular and easy plants to grow indoors. Peperomia can be grown in a flower pot or in terrariums, as it usually does not grow more than 4-10 inches tall. 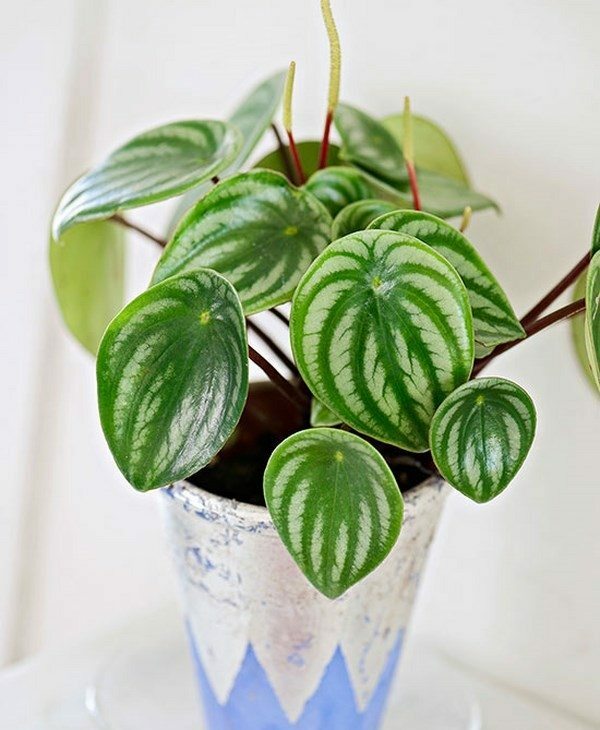 Peperomia comes in a wide variety of leaf shapes and colors and feels best at an indirect light. Allow the soil to dry between watering. Spider plant (Chlorophytum comosum), also called airplane plant received its name from the many runners that come out as baby plants. 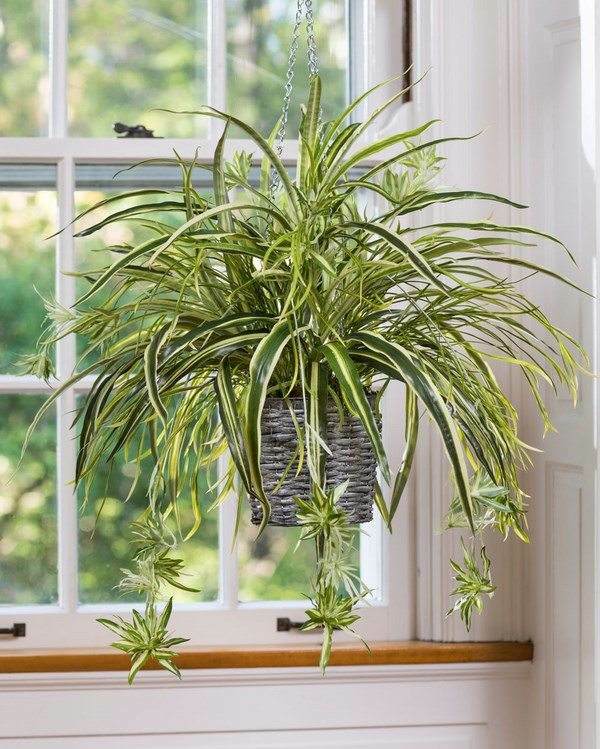 Spider plant is an easy to grow house plant and can be planted in either flower pot or a hanging basket. 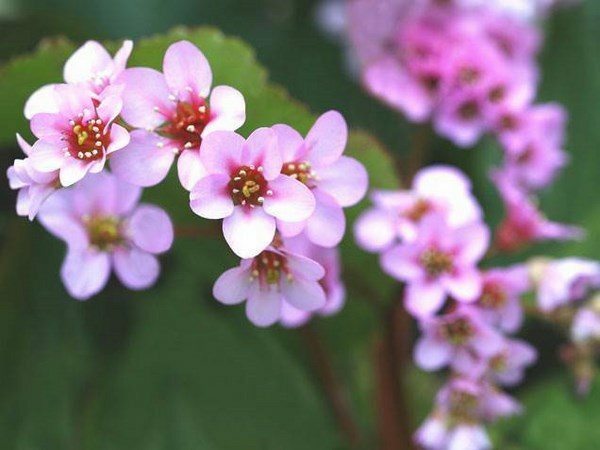 It is an excellent choice for beginner gardeners as the plant does not require a lot of care and will grow even in low-light conditions. Let the soil dry slightly between watering. Anthurium is a flowering plant and comes in a variety of species. 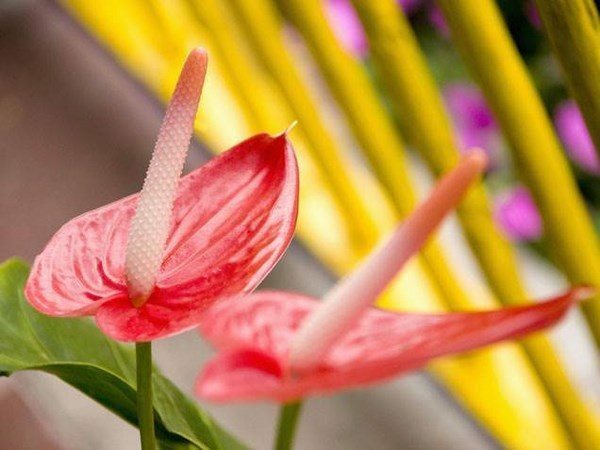 It is also called tail flower, flamingo flower, and the most popular house plant species is Anthurium andreanum which has heart-shaped leaves in red, white, pink and variegated colors. Anthurium, like sunflower, can move its leaves toward or away from the sun. 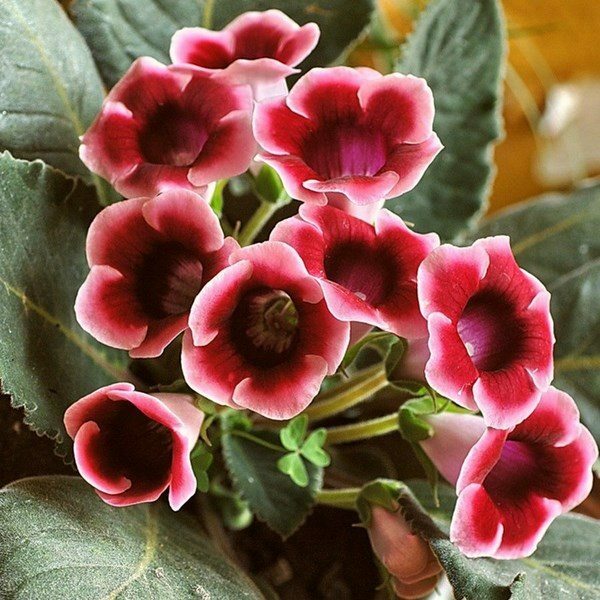 It needs bright indirect light and the soil should be moist at all times. Begonia (Begoniaceae), as an indoor plant comes in so many varieties that it may be difficult to choose which one to grow. Begonia species differ in size, color, and shape of flower and leaf. The group of Rex begonia offers a large range of colors– silver, green, pink, red, orange, and burgundy, shapes, and textures. 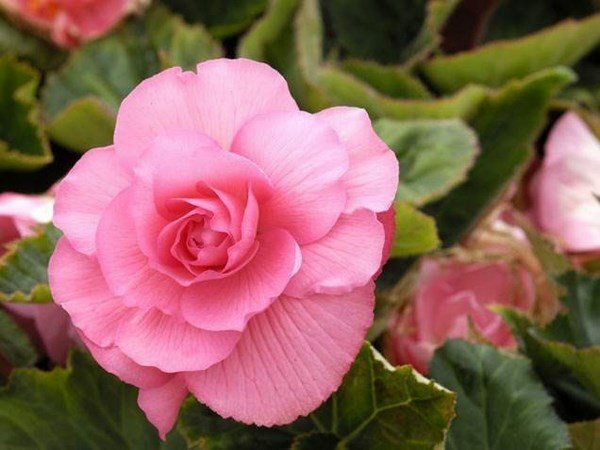 The best conditions for begonias are slightly moist soil and indirect light at all times. 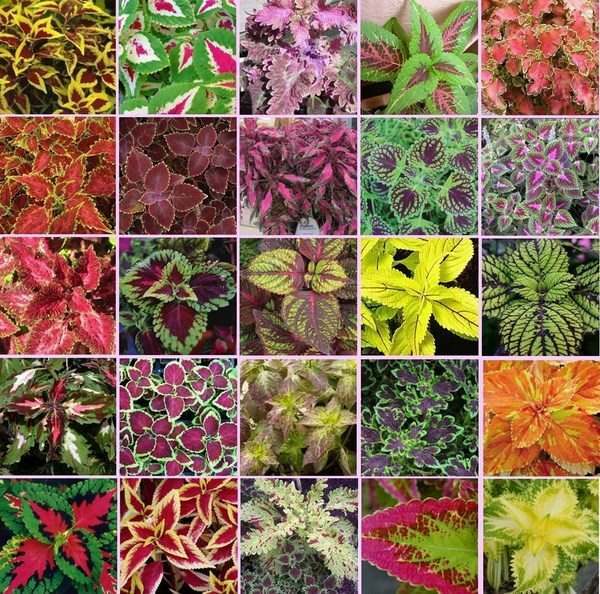 Coleus (Solenostemon scutellarioides) is a plant which comes in an amazing variety of brightly colored leaves – from golden yellow to burgundy, and brown color. The leaves also have a different shape – rounded oblong, fringed, scalloped, etc. Coleus requires abundant light, including several hours a day of direct sunlight and needs to be moist. Keep in mind that low temperatures and drought are not beneficial to the plant. Usually, Coleus blooms in the summer. 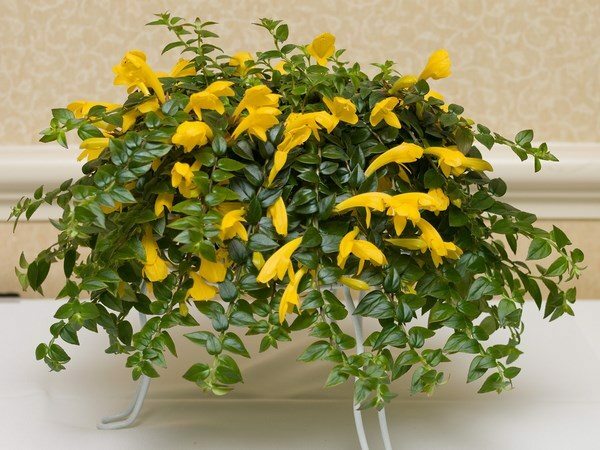 Columnea, known as goldfish plant, has more than two hundred varieties. 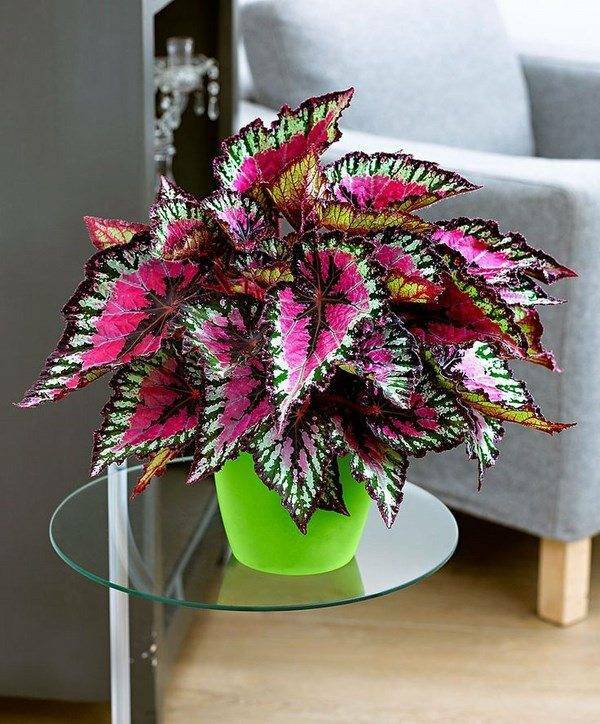 Columnea species are easy plants to grow indoors and are a great option for windowsills. Columnea has long, tubular, blooms which give the look of ‘flying fish’ and well-grown plants can have more than 50 blooms at a time. Water when the soil feels dry to the touch. Croton (Codiaeum variegatum pictum) is a spectacular indoor plant and its gold, pink, and orange tones add an exotic touch to the home decor. It has large leaves look at their best when exposed to bright light. 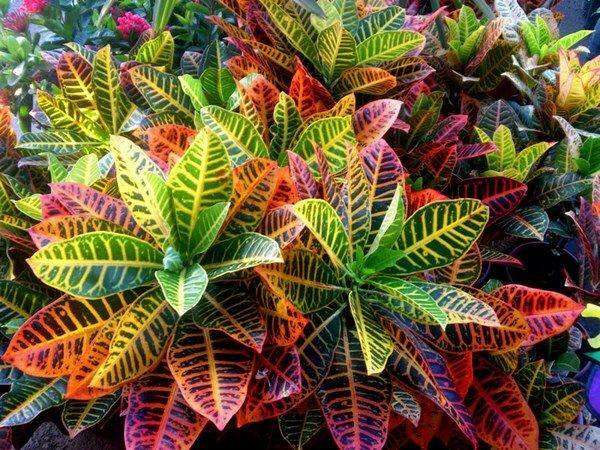 Croton should be watered when the soil surface feels dry. An important consideration is that the plant is poisonous and will make children or pets sick if they chew on it or eat it. 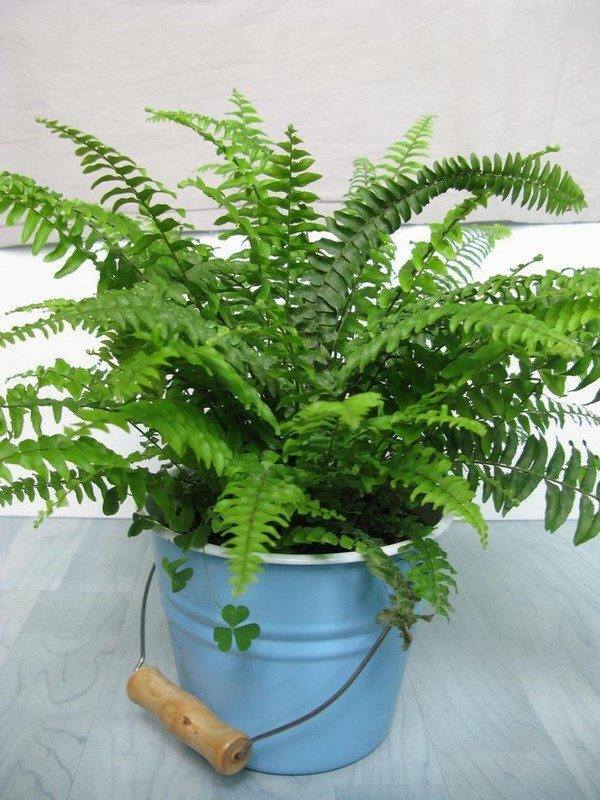 Boston Fern (Nephrolepis exaltata) is a true classic for indoor gardens. Boston ferns will thrive if placed in a cool place with high humidity and indirect light. Make sure that the soil remains damp. Lack of moisture will make the leaves of Boston Fern turn yellow. 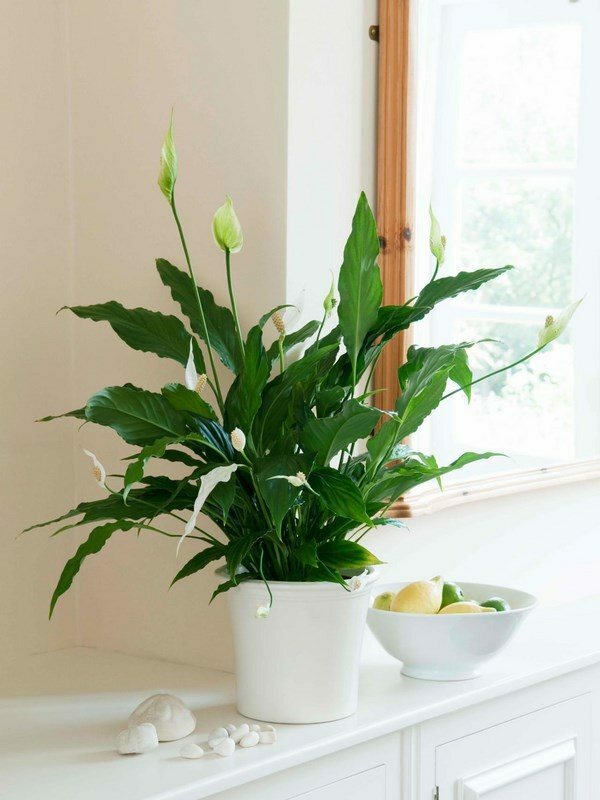 Peace lily (Spathiphyllum wallisii) is a beautiful and easy to grow indoor plant with beautiful foliage all year-round. It has glossy leaves and tender white blooms. Peace lilies prefer shade and some indirect light. Too much light may cause brown spots or streaks on the leaves. Water about once a week and let the soil dry between watering. The plant is known for its air-purifying abilities as well. 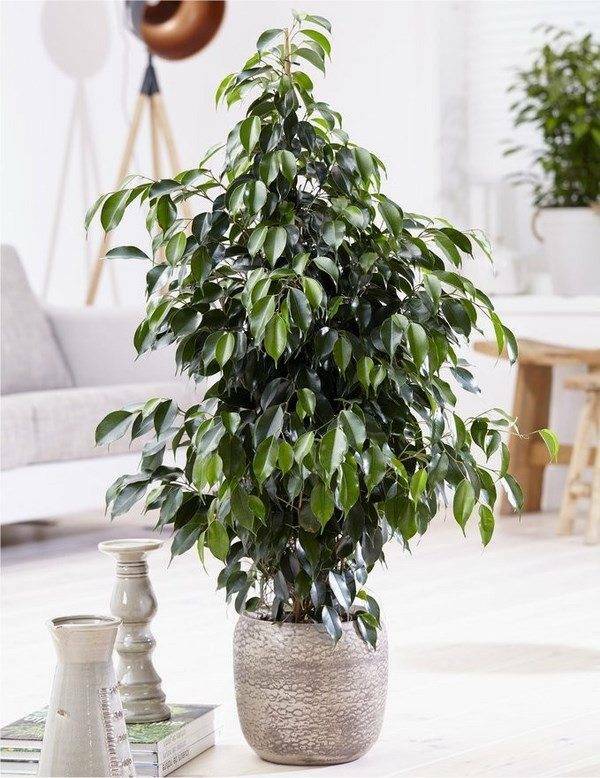 Weeping Fig (Ficus Benjamina) also called Benjamin Fig is one of the most popular house plants from the Moraceae family. It is a slow growing plant which comes in many varieties. The plant may reach up to 3 meters height (10 ft) while the dwarf varieties will not exceed 90 cm (3 ft). Weeping Figs need bright, indirect light and do not tolerate soggy soil. Water thoroughly then allow the soil to dry out slightly between watering. The plant is known for dropping its leaves when moved around. 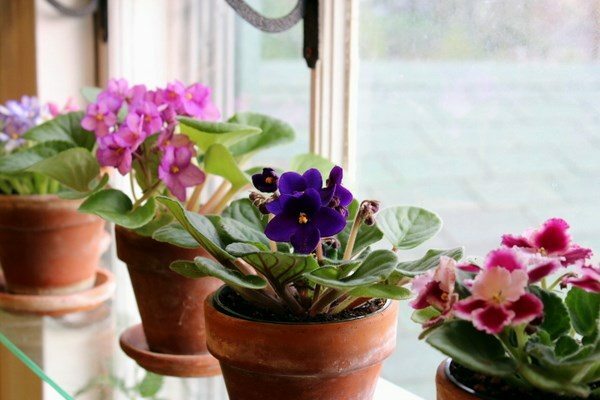 The African violet (Saintpaulia) is one of the popular flowering house plants and with proper care the plant will flower any time of the year. However, African violets are capricious and require more care than other house plants. 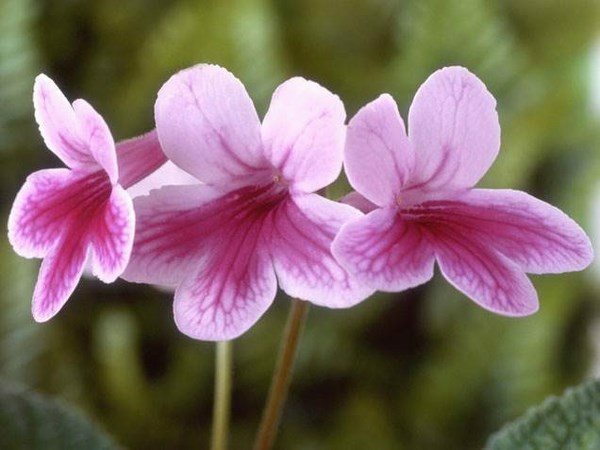 When watering African violets you need to make sure to water the plant only at the base and never splash water on the foliage as water damages the leaves. It is best to use lukewarm water that was allowed to stand for 48 hours. The violets should be watered when the soil feels less moist to the touch. Light affects flowering. Violets need bright to medium bright light. Dead flowers and damaged leaves must be removed as soon as possible. Gardenia is a flowering plant with more than one hundred varieties. 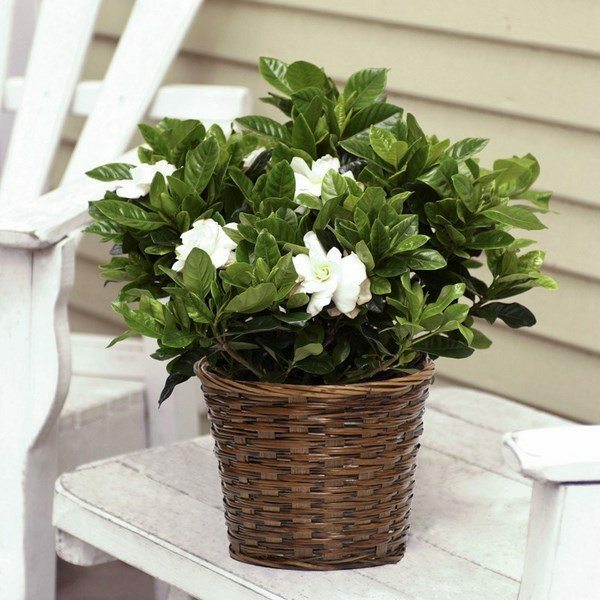 Gardenia house plant is one of the most fragrant flowers which can be grown indoors. It needs plenty of water and light, cool temperatures, and high humidity. Arabian Jasmine (Jasminum sambac) is an evergreen shrub and grows like a small shrub or a vine. Arabian Jasmine has sweetly fragrant flowers white or pink and is one of the best plants to grow indoors. It blooms throughout the year and requires little maintenance. Jasmine prefers full sun and at least 6 hours of sun light, but it will tolerate partially shaded conditions as well. 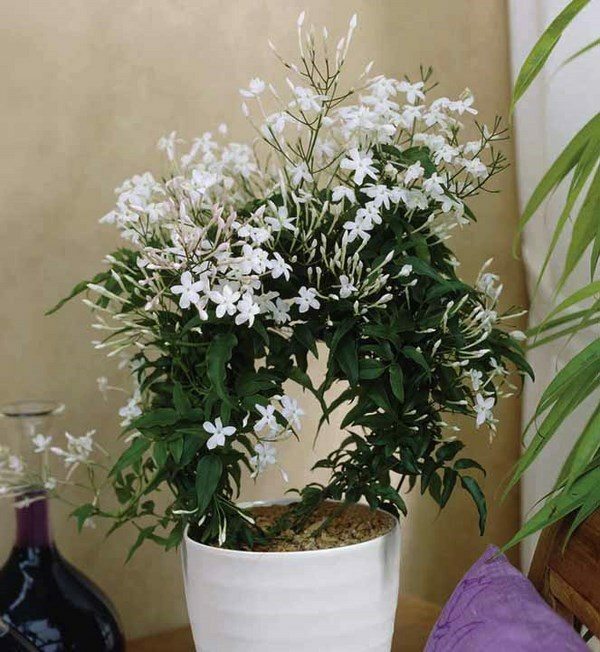 Jasmine needs to be watered thoroughly and the soil should dry out between watering. 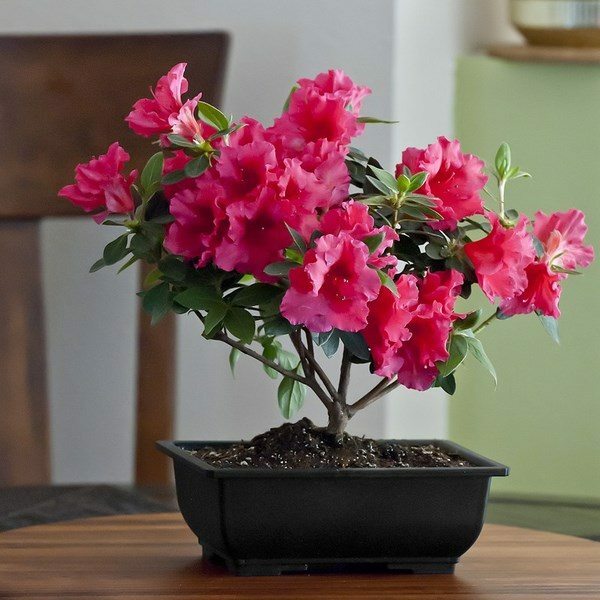 Azalea is a strikingly beautiful, multi-colored plant which can be grown indoors. Azalea colors vary from pure white to pink, purple, red, and in many garden centers, you may have about thirty varieties to choose from. 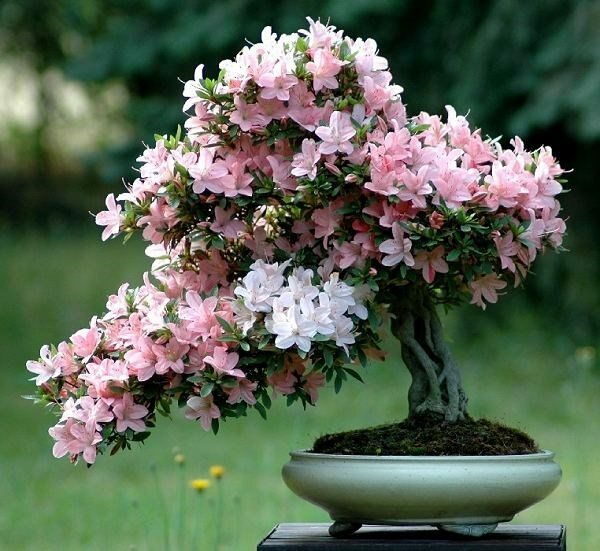 Indoor azaleas need acidic, well-drained soil. Keep the soil moist but not soggy. Azaleas should not be exposed to direct sunlight, as it may cause their blooms and leaves to turn brown and die. 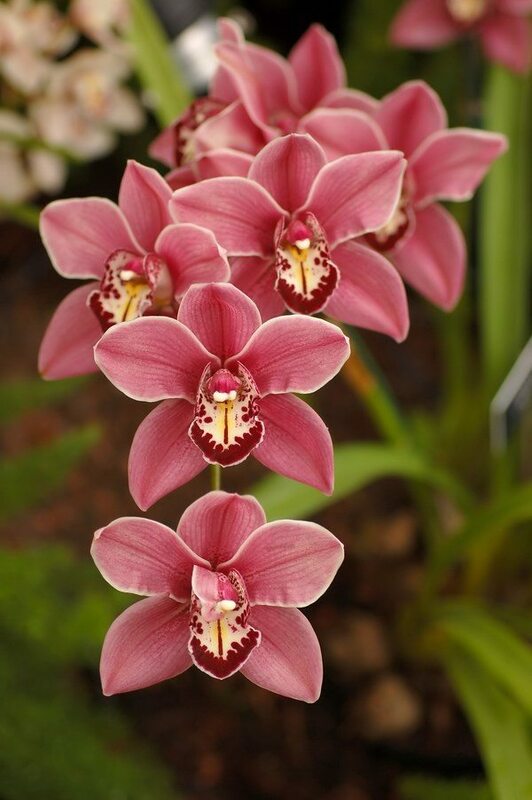 Orchid (Orchidaceae) is often called the Queen of indoor plants. A symbol of beauty and elegance, Orchids come in so many varieties to choose from that you may have difficulties to pick up from the hundreds of magnificent species. Orchids hold their blooms for up to four months and tolerate low-light locations. Generally, orchids need to be watered every five to twelve days but different varieties have different needs and the watering will depend on the type of orchid you have. Orchids do not like overwatering. Usually, orchids grow in bark and should be watered when that material feels dry. 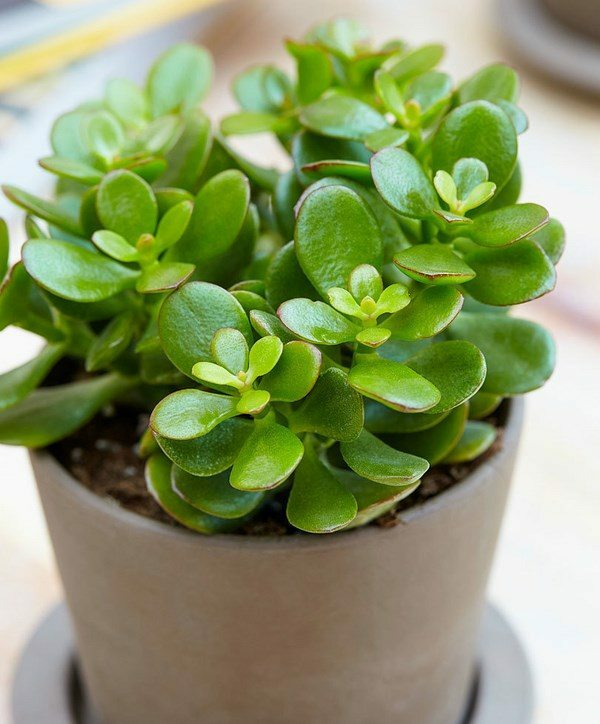 Jade plant (Crassula ovate) is known as friendship tree, lucky plant, or money tree is an excellent choice for those who have an issue with watering their indoor plants. An evergreen plant with thick branches, Jade plant may survive for years. It is a slow grower and tolerates bright light and lack of water as it has low-water requirements. Jade plant can be grown as a bonsai tree but requires a relevant pruning. Geraniums (Pelargonium x hortorum) are bright, colorful and come in a variety of vibrant colors. They are a favorite of hobby gardeners and they are especially easy to grow. Geraniums need bright light but will tolerate moderate light conditions as well. Geraniums thrive when the soil dries out between watering. 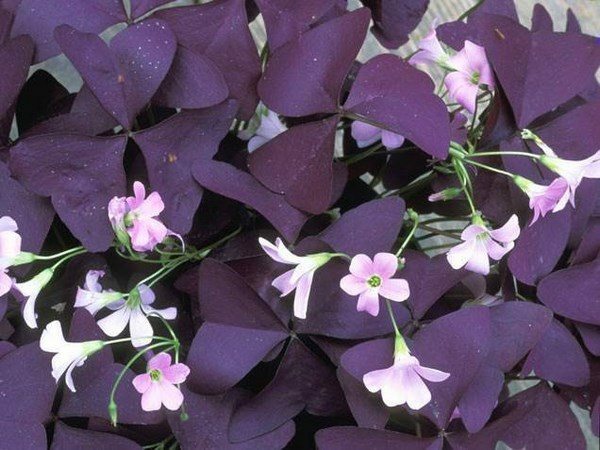 Oxalis (Oxalis triangularis), commonly known as the false shamrock or Purple Shamrock, is a perennial flowering plant with shamrock shaped purple leaves and pink or white blossoms. 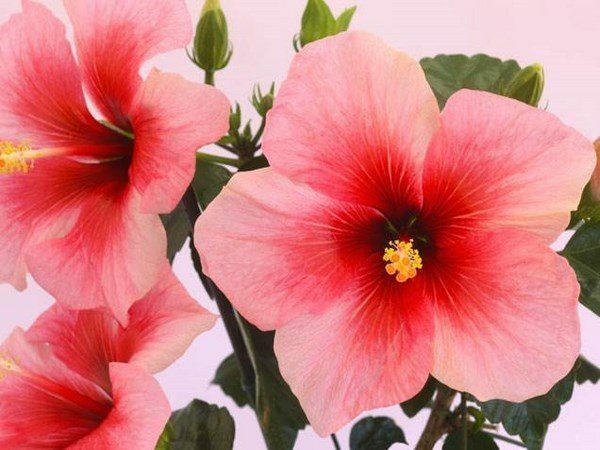 It is a very easy to grow flower indoors and you can water it two to three times a month. Allowing soil to dry out between watering. Succulents and cacti are probably the easiest plants to grow indoors and all they need is a sunny spot and occasional watering. 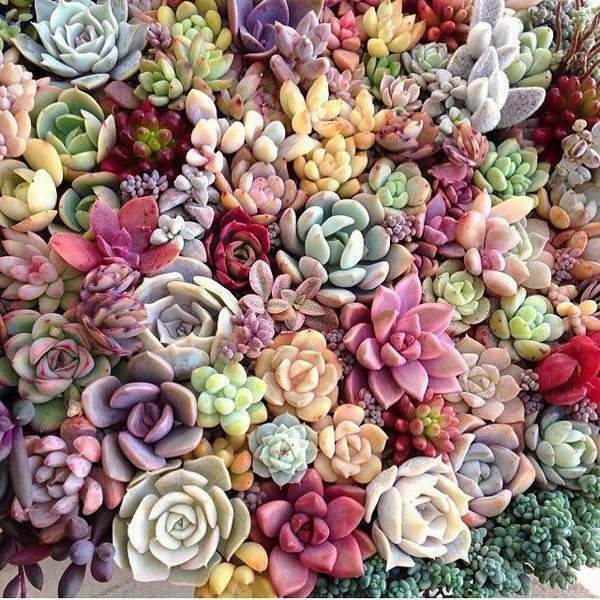 Succulents come in a wide variety of species and colors. They can be grown in a group or combined with other house plants and arranged in beautiful compositions. 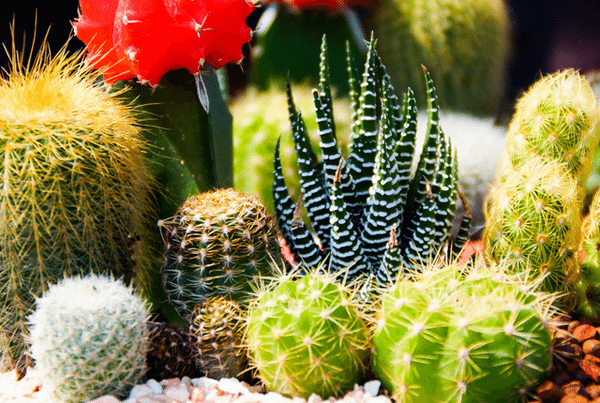 Cacti, just as succulents, require only modest amounts of water but need abundant light. Bright, sunny windows are the best place for them.